In what is set to be the largest event of its kind in the South, Portsmouth Comic Con – International Festival of Comics, has today announced details of a range of entertainment zones that will feature alongside the stellar line up of comic artists and writers, which is garnering huge interest amongst comic fans and the industry alike. Bringing you the best of comic, film, TV and pop culture entertainment, visitors to the two day Bank Holiday weekend event in May, as well as meeting the stars behind the cameras, will go behind the science of comics and the screen through a range of panels, exhibitions, displays and workshops, offering fun for all the family. In a Virtual Reality Zone hosted by The University of Portsmouth visitors will discover virtual reality, motion capture, screenings, game demonstrations, robots and more in a showcase of state of the art technology and emerging student talent. A Wonder Zone will include British FX artist, Gary Pollard, who has worked on Harry Potter, Jim Henson’s The Storyteller, Doctor Who and Red Dwarf, demonstrating his amazing talent and skill in prosthetic make up. There will also be a character illustration workshop, an Ewok exhibition and Steampunk and costume displays. There will also be the chance to get hands-on in an Interactive Zone of video and gaming, featuring a figure making workshop with War Games and creative craft for kids. A series of panels hosted by some of the best and most experienced artists and writers in the industry will include discussions on Star Wars, Dr Who and support for budding artists wishing to break into the industry. Plus a fantastic range of comics, art, prints, crafts, toys, collectables, merchandise and more featuring leading UK retailer, Forbidden Planet International, will be available at the event’s Comic City. Cosplay is of course encouraged with competitions running on both days for adults and children. Who will you be – Darth Vader? Wolverine? Thor? Harley Quinn? Declan Shalvey, a distinctive Irish artist and writer is the latest name to be added to the line up of guests in the Artists Alley. 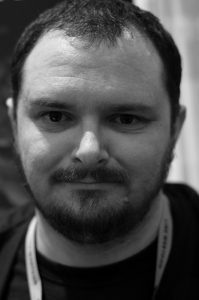 First making his name on UK indie comic, Hero Killers, Declan soon moved on to work for Classical Comics before being noticed by Marvel and DC, working on All-Star Batman, Thunderbolts, Moon Knight, Deadpool and Civil War: Choosing sides. He has had his work published extensively and featured in the graphic novel, Savage Town, which he wrote for artist Phillip Barrett. Shalvey replaces Tess Fowler and Geof Darrow who sadly have had to pull out of the event for this year. With even more set to be announced over the coming months, if you are serious about comics, love Marvel films or cult series like Dr Who or are simply looking for a fun family day out this is the event for you! The event is the brainchild of Portsmouth Guildhall and Tripwire Magazine. Tripwire has been, for over 25 years, the pre-eminent comic and genre publication read by some of the biggest names in the film, TV and comic industry. A range of tickets are available and would make the perfect Christmas gift for any comic fan! Take advantage of our Early Bird offer and get your tickets now at www.portsmouthcomiccon.co.uk or call the Box Office on 0844 847 2362 .